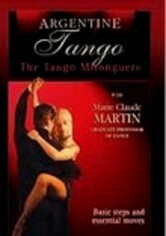 Instructor Marie Claude Martin leads this tango tutorial, focusing on the Argentine and milonga variations of the passionate dance. Drawing heavily on African rhythms, milonga is the primary musical influence on the tango, which originated in Argentina toward the end of the 19th century. Breaking down the basic steps in an easy-to-follow manner, complete with slow motion and clear demonstrations, Marie turns novice students into tango masters.